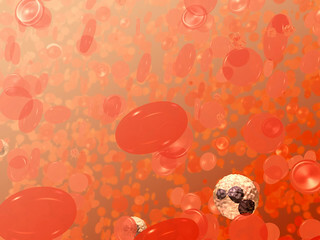 This is a field of blood cells. The bi-concave disks are red blood cells or erythrocytes. The white cell with the dark purplish, multi-lobed nucleus is a neutrophil, a type of white blood cell or leukocyte. The smaller spikey objects are platelets.